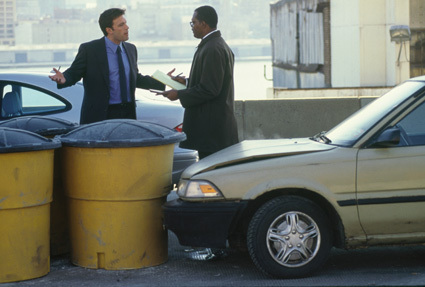 In New York, young lawyer Gavin Banek (Ben Affleck) gets involved in a minor car crash with recovering alcoholic Doyle Gipson (Samuel L. Jackson). Both are on their way to court for very different reasons: Banek to help his law firm take control of a large account; Gipson to argue for joint child custody. The confusion caused by the crash costs both men dearly: Banek loses an essential file that threatens to derail his career. Gipson is late for his court date and loses custody rights, with his ex-wife planning on relocating herself and their kids across the country to Oregon. With both men desperate, they take out their frustration on each other over the course of a single day, while gradually coming to the realization that they both need to re-examine the trajectories of their lives. Changing Lanes is an interesting premise, helped by two good performances from Affleck and Jackson, but undermined somewhat by the increasingly over-the-top actions forced on the two men by an uncompromising script. Banek is quick to illegally destroy Gipson's credit rating, thereby ruining his frail hold on a normal life. He also gets him arrested by framing him for child abduction. 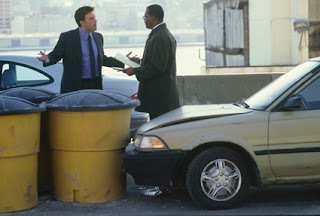 In revenge, Gipson seems to have little hesitation in putting Banek's life in real danger on the freeway. These are not the actions of most normal men, and the exaggerated battle distances the characters from the real world that the movie is otherwise desperate to inhabit. A rich supporting cast adds interest and helps to paper over some of the cracks. Sydney Pollack, in a purely acting role, is Banek's father-in-law and one of the senior partners in his law firm. William Hurt is Gipson's mentor at Alcoholics Anonymous. And Amanda Peet is Banek's wife, as cold and ruthless as her Dad. Toni Collette as Banek's fellow-lawyer and former lover, and Richard Jenkins as another senior partner at the firm, ensure terrific depth. Changing Lanes ends with some welcome vagueness about the future of both men. Some restraint in the lead-up to the denouement would have been equally welcome.